The Blue Diamond is one of the oldest ‘classy’ hotels in Pune. It is also home to two good restaurants, the Whispering Bamboo and the Mystic Masala. While Whispering Bamboo serves very good Chinese and Thai food, the Mystic Masala serves Indian food with a special focus on local Maharashtrian cuisine. Yesterday, I decided to take my wife and daughter out to dinner, and we decided to try the Mystic Masala and sample some of the food items native to the city of Pune. 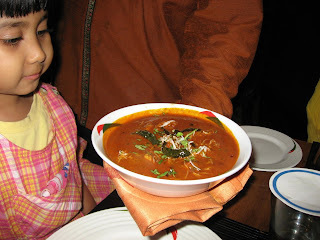 The soup, Murg Goli Shorba, was delicately spiced and contained dumplings of minced chicken. 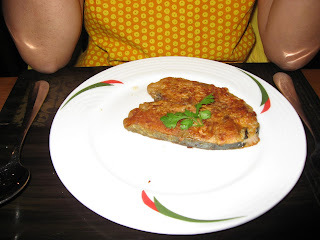 This was followed by Tawa Macchi, which was a fillet of a local fresh water fish shallow-fried with spices. Our main course consisted of Komdi Kolhapuri, which consists of succulent morsels of chicken in a fiery red gravy, Alu Chi Pattal Bhaji made from leaves of colocacia cooked with lentils and peanuts which was sweet-sour and delicious. We also had a local variety of bread called Bhakri and masala bhat, which is rice tossed with spices. All in all, a very interesting dinner. The fish was not particulary exciting, but the rest of the food was delicious and very different from the usual kind of Indian Food we eat. There are a few more pictures I took in restaurant here. The Blue Diamond is located in the Koregaon Park area and known by all in Pune. So, locating this hotel will not be a problem if you hop into an auto-rickshaw or take a taxi. 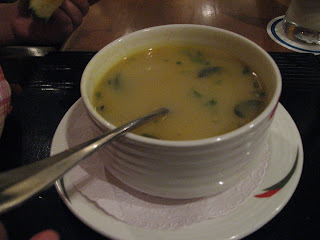 It's interesting that the word for soup, shorba, is the same in Arabic. 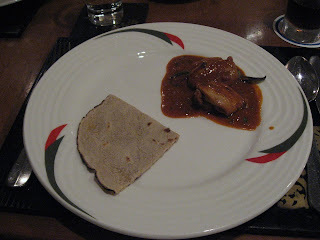 I got a link to your blog when I was complaining to a friend about the restaurants in Pune. We moved to Pune recently, and my husband and I haven't yet found a place that we would want to go back to,. OK. Malaka Spice is an exception. But your blog has talked of so many places that I am sure the next couple of weekends are going to be absolutely busy! Thanks for making the blog happen! !